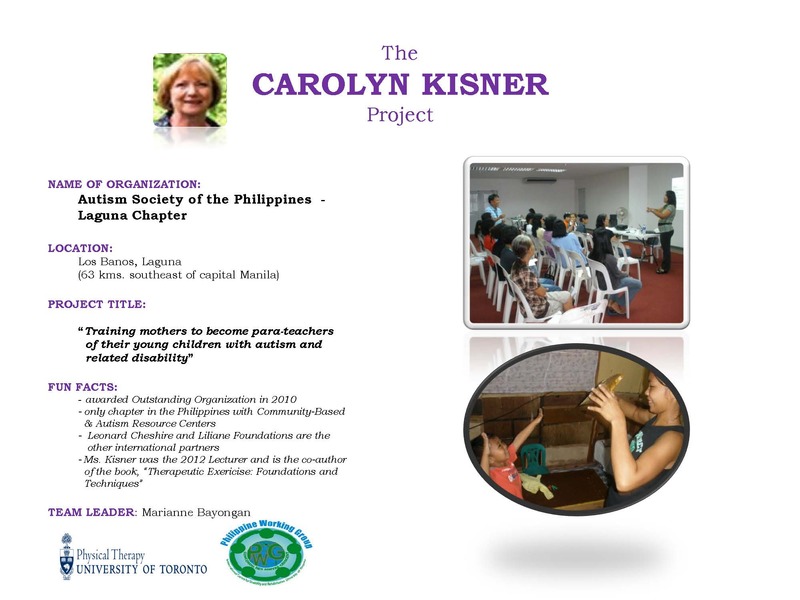 The ASP Laguna Chapter is the recipient of a one-year grant entitled “The Carolyn Kisner Project: Training of Mothers to Become Para-Teachers of Their Young Children with Autism and Related Disability” from the International Centre for Disability and Rehabilitation (IDCR). The IDCR has members that span around the globe including the Philippines, Canada, Australia and the United States. Its global partners include individuals and groups from the disability community, academia and professional organizations. ICDR Philippines’ mission is to promote the equalization of opportunities for Filipinos with disabilities. Its many endeavours are guided by the core values of partnership, respect, and mutual cooperation. It firmly believes that disability is a human rights issue and therefore a critical component to social development. The organization's motto is "Concordia Res Parvae Crescent' -- Working together to accomplish more. This project with ASP Laguna was named after the lecturer, Ms. Carolyn Kisner, MS, PT who specializes in sensory-motor therapy and is the co-author of “Therapeutic Exercise: Foundations And Techniques”. Under the Carol Kisner project, ASP Laguna will conduct workshops and train ten mothers of young children diagnosed with autism and other developmental disorders and help them equip and implement early home programs. They will be coached in implementing sensory-motor activities to a group of children with disabilities, including their own children. About the Author. Ms. Catherine Lopez of ASP Laguna is the mother of Ian Lopez, an adult on the spectrum. ASP Laguna Chapter was established last October 1998 with the help of other parents and professionals and is the first group in the country to establish an Autism Resource Center.